Below is TracfoneReviewer's review of the Alcatel Sonic. We will share a variety of features and details for the phone, and provide information on where to buy this phone. We hope you find this review helpful! Tracfone is steadily releasing new smartphones and the latest release is only the second phone with 4G LTE coverage. Tracfone Wireless is a prepaid service and cell phone provider with a variety of low cost devices and airtime options. They contract with other major cell phone carriers like Verizon and AT&T to provide coverage over their existing networks. Tracfone is a smart choice for people who want a cell phone, but don't want to pay monthly contract prices. Over the last few years Tracfone has released a number of Android powered smartphones to use with their service. This review will cover the Alcatel Onetouch Sonic, which is the latest phone available with Tracfone and comes with 4G LTE coverage. If you're interested in the other Android phones from Tracfone, look no further than our Android Tracfone list which contains almost every smartphone available with Tracfone. The Alcatel Onetouch Sonic is the second phone from Alcatel, following the Alcatel Onetouch Icon Pop. The Icon Pop had a large 5" screen, but the Sonic has a slightly smaller 4.6" screen. We want to share our quick points about this phone, and then get into the full list of features. There are a couple of things about the Sonic that make it desirable, but there are also several features that are similar, or even worse than other phones available from Tracfone. Let's take a look at the full list of features and specifications for the Sonic. Size: 5.28" x 2.74" x 0.43"
Several interesting features listed for the Sonic, particularly 4G LTE connectivity, but also the 4.6" touchscreen, and the 1.4 Ghz dual core processor. The Alcatel Sonic has all the other features you would expect from an Android smartphone such as front and rear camera, WiFi, Bluetooth and speaker. It also has all the features you would expect from a Tracfone device like Triple Minutes for Life, Caller ID, Voicemail and more. While there are some good features on the Sonic, there are also a few things we want to point out so that consumers are aware of them before purchasing this device. Let's get into our review of the Alcatel Onetouch Sonic with what we like, and don't like, about this device. If you want to see some phones we really don't like, take a look at our list of the Worst Tracfone Cell Phones. The Alcatel Sonic is, overall, a pretty average Android phone except for one main feature - 4G LTE. This faster connectivity speed (4G really means 4th generation) allows you to download and surf the web much more quickly than 3G devices. And the nice thing is, you are paying the same for it with Tracfone. We believe the Sonic will use GSM networks from AT&T, just like the LG Sunset. The 4.6" touchscreen is good, and similar to many of the other smartphones available with Tracfone. Now let's take a look at some of the features that we weren't happy with. There are several features this phone comes with that we don't like because they are similar or slightly worse than what we can get form other Tracfone devices. The Sonic comes with Android 4.1, which is not the latest, or even almost the latest. There are several phones available from Tracfone that have Android 5.0, like the LG Sunset, or LG Power. While it isn't a big deal to use an older version of Android, it would be nice if it were updated. Loading and storing apps, photos and other media on the Sonic may create a problem since the Sonic only comes with 4 GB of internal memory, with about half of that used up by the operating system. Again, several other Tracfone smartphones offer about double the internal memory as the Sonic. You will probably want more space if you're going to put more than a handful of apps on this device. The camera on the Alcatel Sonic is also nothing impressive. It does the job, and has a front facing VGA camera for video chats, but doesn't stand apart from other devices. We like that this phone has 4G LTE, but the rest of the features on this phone seem a little outdated. For those who don't plan to use their phone too much, this device will probably be just fine. But if you want to get more from your device, you probably want to go with something else, and maybe even consider the Tracfone BYOP program. As we said above, the Sonic is a pretty good phone, but there are other phones that are better for a similar price. The LG Ultimate 2, ZTE Quartz, LG Power and LG Sunset are each similar to the Sonic, but with improvements in various ways. This phone will probably perform just fine for the majority of users who purchase it, but if you want the most for your money, you may want to consider the LG Sunset, or the BYOP program. Even the LG Ultimate 2, which was released over a year ago, has a number of features that are similar or better than the Sonic, most notably, more internal memory for storing apps, pictures and other things. We're not saying the Sonic is a bad phone, but just that there are some other good phones out there as well. We'll let you make your own decision. 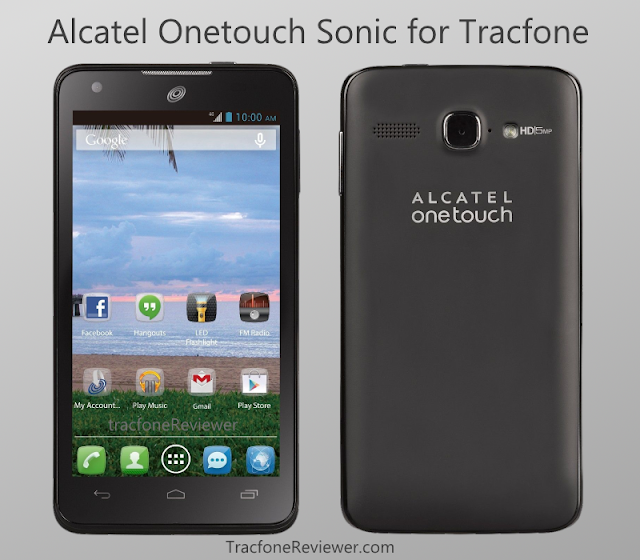 The Alcatel Sonic hasn't been found on the Tracfone website yet, but it is available through several other online retailers. We expect that the Sonic will be available in stores and on the Tracfone website sometime in the near future. It is not uncommon for the phone to be available on eBay and Amazon before the Tracfone website. Android phones work a little differently than non-smartphones with Tracfone. One of the biggest differences is that you get you minutes split up into talk, text and data pools that are each separate. You also get Triple Minutes for life on every Android phone. You can also take a look at the Alcatel Sonic Interactive Tutorial to help you learn how to use the phone. That completes our review of the Alcatel Sonic. We hope you found it informative and useful. If you have questions or something to share, leave a comment below (we review every comment before posting, to keep out spam). 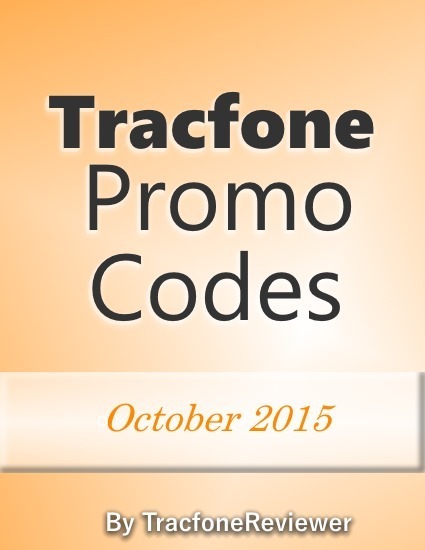 Don't forget we also have Tracfone Promo Codes, although they won't work with smartphones. And join more than 1300 followers on Facebook where we share our latest updates, news and posts! This post is created by TracfoneReviewer and shares some of the phones we wouldn't recommend for most Tracfone users. Tracfone is a prepaid wireless cell phone company that provides low cost phones and cell coverage. The phones they offer are usually a few years behind the latest technology, and sometimes have some serious drawbacks. Here at TracfoneReviewer we provide lots of cell phone reviews, and are generally very excited about the new phones Tracfone releases, because we like the value (cost vs benefits) Tracfone provides and the new phones bring. However, over the years there have been several phones released by Tracfone that have really been pretty poor, especially as we've had time to look at user reviews and compare them to other devices. So which Tracfone cell phones are the worst? We're going to share our pick below! Before we get to our pick, we want to clarify a few things first. Has issues that the majority of users experience - thus not a case of one defective phone, but all phones being defective. Or lacks proper features/specs to make the phone usable for the majority of people (and there are other phones available that do). Both of these points are sometimes hard to recognize in a newly released phone because we either don't have enough input from user reviews, or we don't have other phones to compare the new device to. Over time we are able to gain a better picture of whether a phone is 'good' or 'bad' based on how it is performing, and how it compares to other phones available. Let's be clear, each person has different needs and expectations for a phone, and so some phones may not meet the needs/expectations of the majority of people, but for a few people it may perfectly meet their need. Some Tracfone users prefer a smaller touchscreen and don't want the features that come with an Android powered smartphone. So while we will be highlighting a few phones and designating them as 'bad' phones, they may still be a good choice for some people. Drop a comment below if you want to add your thoughts on 'good' and 'bad' phones, or if we weren't clear in defining this. Now, let's get to our picks for the worst Tracfone cell phones. There are three phones that rise to the top of the list for worst cell phone from Tracfone. Number two and three are the ZTE Valet and the LG Optimus Dynamic. These two phones are basically tied for second worst phones from Tracfone. The LG Optimus Dynamic, when it was released, had some of the best and most advanced features for a Tracfone device yet. It came with Android version 2.3 which allowed users access to thousands of apps on Google Play. Until the Optimus Dynamic, Tracfone users had not had access to a true smartphone. When the LG Optimus Dynamic was only about $20, I picked one up and enjoyed using it for a while. One of the major strengths of a smartphone is the ability to install applications that can do many different things. So when the Optimus Dynamic could only hold a small handful of apps, it was defeating the purpose of being a smartphone. Some users were able to move apps to the external SD card, but not all users were interested in trying this, and were left with a phone that would often have 'memory full' messages pop up. If you're looking for new apps, take a look at our List of the Best Apps for Android which may contain some new ideas for you! The ZTE Valet came after the Optimus Dynamic, and improved on it in a few ways, such as a newer OS, Android 4.1. However the quality of the Valet was soon brought into question as many users noticed both poor sound quality when making phone calls, and poor WiFi reception in their home. These issues were prevalent for the majority of Valet users and caused many to look for a new phone soon after getting the Valet. 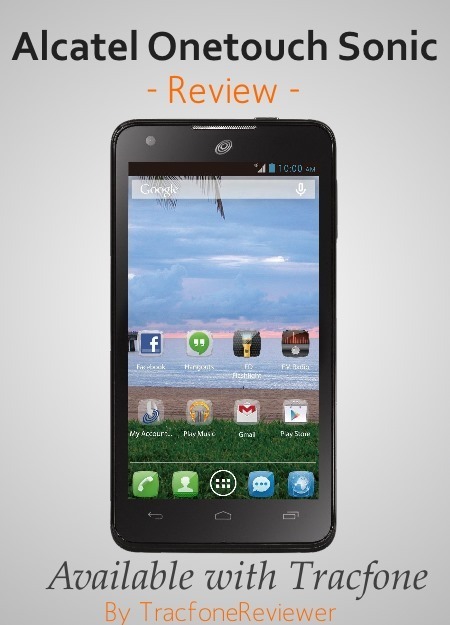 The new and improved LG Optimus Dynamic II was a popular choice. Let's hope the issues with the ZTE Valet are cleared up for the more recently released ZTE Quartz. And finally, the worst phone released by Tracfone is the Unimax MaxPatriot. Unlike the ZTE Valet and LG Optimus Dynamic, the MaxPatriot was an inferior phone from the start. When it was released there were several other phones from Tracfone that were significantly better (specifically, the LG Ultimate 2). Plus, user comments and reviews quickly outlined a number of quality issues with the phone, and the phone manufacturer. Other comments were more restrained and merely read, "ditto on all the bad reviews." To be fair, there were some comments from users who actually liked the phone, or at least weren't unhappy with it. While there are other phones from Tracfone that do have their issues, none (as far as we know) were as bad as the Unimax MaxPatriot. 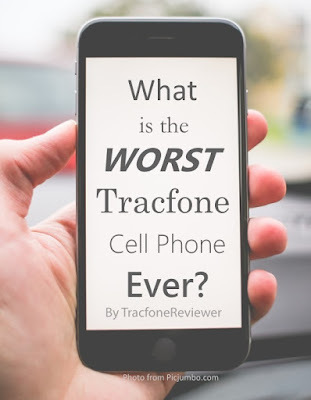 Let us know in the comments what your choice for the worst Tracfone would be, or if you have had a good experience with any of the phones in our list. If you're looking for a new phone, we recommend taking a look at our Tracfone BYOP page where you can learn all about bringing your own phone to Tracfone. This includes a wide variety of GSM and CDMA phones, and even 4G LTE devices. You can find a list of compatible phones on that page as well. 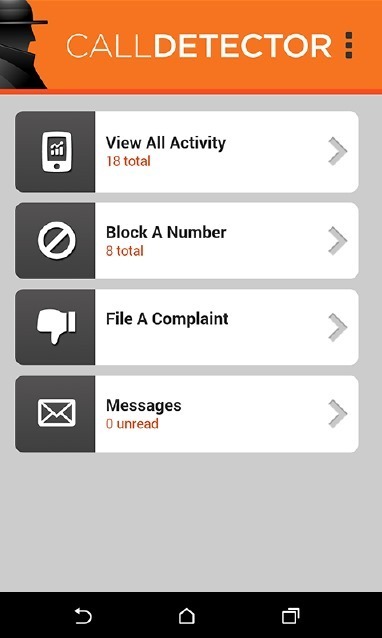 We also recently reviewed the Call Detector App, which you can use on Android devices to block unwanted calls. Stay up to date with the latest Tracfone news and information by following us on Facebook! As Black Friday and Christmas approach, Tracfone has traditionally released new phones or great deals, and we will share them both on the Facebook page, and here on the blog as we find them. Thanks for visiting and we hope this post was useful and informative! Below we review and discuss an app available for Android users that can block unwanted calls. 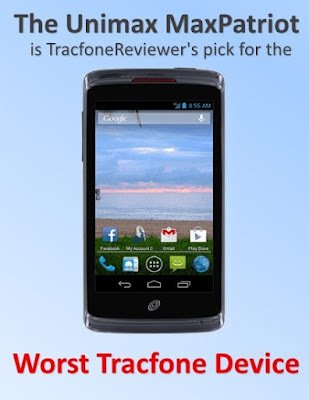 TracfoneReviewer is a blog dedicated to providing resources and information about Tracfone, and we share lots of different things from cell phone reviews to promotional codes. So have a look around if you want to learn more about Tracfone! Many Tracfone users find it even more annoying than the average person when they receive a telemarketing or other unwanted call because it costs airtime. Even if you answer, then then hang up moments later, it will still deduct minutes form your Tracfone account. The only way to combat this for many users was to try and pay close attention to who was calling, and then simply try to avoid answering it. But this isn't always possible, and sometimes we answer the phone without thinking. Unwanted texts are also another way we lose valuable minutes. And on Android phones, there isn't a way to choose which texts you open (and pay for) and which you don't. So any text you receive on an Android phone reduces your remaining text balance. Well Tracfone must have noticed consumers dissatisfaction with this, because they recently started promoting a free App for Android phones that says it will, "block any unwanted phone calls as well as automatically block all known scam callers." So does this app work and will it block those annoying telemarketers? We're here to test it and find out, and then share the results with you below. For those who might not know, Tracfone is a prepaid wireless cell phone company. They offer both cell phones, and prepaid airtime that allows users to pay for only what they plan to use. You can learn more about Tracfone by reading our Beginners Guide to Tracfone. What is the Call Detector App? The Call Detector App makes it possible to select numbers from your contact list or recent callers and choose to block their number. This is really great if you tend to get a lot of unwanted calls form the same number. The app is free to download, but does offer a premium upgrade that removes ads, and allows users to have unlimited Caller ID and Reverse number lookup, among other bonuses. The Call Detector App says it was specifically created for Tracfone and Tracfone's other companies like Straight Talk and Net10. Now we want to share what we thought of the app in our review of the Call Detector app. 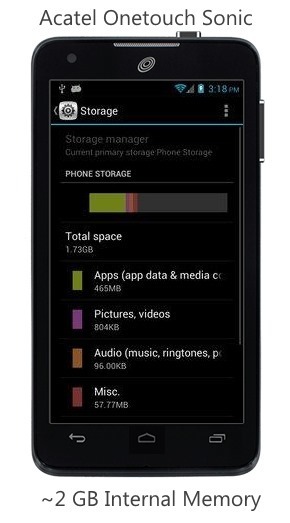 The app takes up about 9 MB of space on the internal memory, which isn't very much, and not a problem for the Ultimate 2 that comes with around 4 GB internal memory, but for some of the older Android phones you may not have much room to work with. When loading up the app you will have to give Call Detector access to a number of different things on your phone, but this is what allows the app to automatically block calls, and select numbers to block from your list of received calls. The home screen is simple, and we were able to quickly view either a list of our contacts, or recently received calls and choose from these lists any phone numbers we wanted to block. You can also choose to view the apps activity (what phone calls it has blocked), file a complaint through the app, look up a number, or purchase the full version. We selected a few numbers to block, and then tested the app by using those numbers to call the phone. When a blocked number calls, you briefly see the call screen flash on the smartphone's screen, and then the call is disconnected. In the app's activity section, you get to see who called and what time they called. We also tested blocking text messages, which we can't tell if this app is supposed to block. It does track both the number of calls blocked and texts, but in our test the text message was not blocked. We're going to continue testing this. Looking up numbers is also a convenient feature on the Call Detector app and sometimes we would get the name of the caller, other times just the location of where they were calling from. With the free version of the app you only have a certain number of numbers you can look up. We were not able to test the app's claim that it automatically blocks known scammers, or can automatically notify you if the caller is a telemarketer or debt collector - we just haven't received any calls like this yet. But if you test this out, let us know in the comments how the app functions for you. Does the Call Detector App Work? Well, yes, it does seem to work well at blocking numbers you choose for it to block. This is very handy if there are certain callers who keep bothering you. Will it block text messages or automatically block telemarketers? We couldn't quite determine this and will continue to investigate. Overall we found this app was well designed, looked good and functioned as expected. On Google Play it is rated 4.2 stars out of 5, which is a good rating. It also has more than 100,000 downloads and will work on Android versions 2.3 or higher. There are a variety of other call blocking apps available on Google Play, but none of them seemed any better than Call Detector. 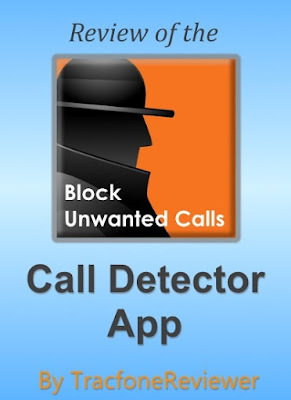 If you're tired of getting sales calls, or just want to block a few numbers, Call Detector is a great app for doing that. You can read more about Call Detector, and download it for yourself, on Google Play. We hope this information is helpful for you! Leave a comment if you have any questions, or want to share your experience using this app. If you're interested in what Android phones Tracfone has to offer, take a look at our recently updated List of Tracfone Android phones. You can see all the smartphones available from Tracfone, and quickly compare some of the key features from each phone. You may also be interested in the Tracfone BYOP program, which allows consumers to bring their own smartphone to use with Tracfone, including both GSM and CDMA 4G LTE devices. Thanks for Visiting, and don't forget to join us on Facebook! Below are the latest promotional and coupon codes for Tracfone that we have collected and shared. TracfoneReviewer works hard to provide helpful and useful information and we hope these codes get you some free minutes! 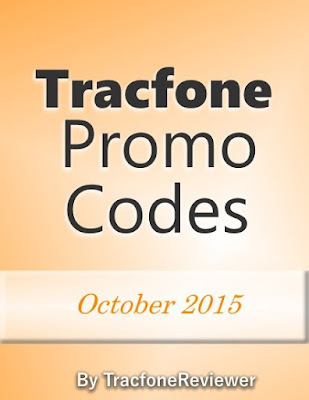 List of Tracfone Codes for October 2015! Tracfone is a prepaid cell phone company that provides both service and phones to their customers. Service, or airtime, is purchased in a variety of minute card amounts and can be done online, or in many stores. When adding airtime to your phone, Tracfone users can also use a promo code to get additional minutes for free. Each promo code is listed for a specific airtime card amount, but can also be used for any airtime card of greater value (So you can use a code for 120 minute card with a 200 minute card, and so forth). Promotional codes will not work for Android phones (or any smartphones) which includes both the smartphones offered by Tracfone, and any phone on the BYOP program. While this may be disappointing, the newer smartphones offer a lot of good features, including Triple Minutes for Life. We recently reviewed one of the latest smartphones to come to Tracfone which features a large, 5.5" touchscreen. Take a look at our ZTE Quartz Review if you're interested in new phone options. The promo codes below are just the most recent codes we have found that are valid for the month of October. We share this small list of codes here to make it easy to find a code to use that has a high likelihood of working for you. However, not all codes work for every phone, and some codes will only work once per device. You can visit our main Tracfone Promo Code page where we include not only the codes listed below, but many more options as well, including some codes may already be expired, but have a small chance of working. If you're looking for more bonus code options, then go over to our main page. These codes are for the month of October 2015. Some codes can be used only once, while others my be used multiple times. Bonus - Save $15 on the 1 Year/400 Minute card with code 99138 when you buy on the Tracfone website (although, with taxes and fees, you may be better off buying your card on Amazon or eBay). These are the latest codes valid for the month of October and we hope these codes work for you! Leave a comment below with which codes you tried, and how it did. If you're somewhat new to Tracfone, or just find that you have a few questions, then take a look at our Beginners Guide to Tracfone. It will walk you through some of the basic facts about Tracfone service, and the options available to you. If you aren't following us on Facebook, then you're missing out! Join our group of over 1300 people where we share the latest news and updates, and get questions and helpful insights from users like you.